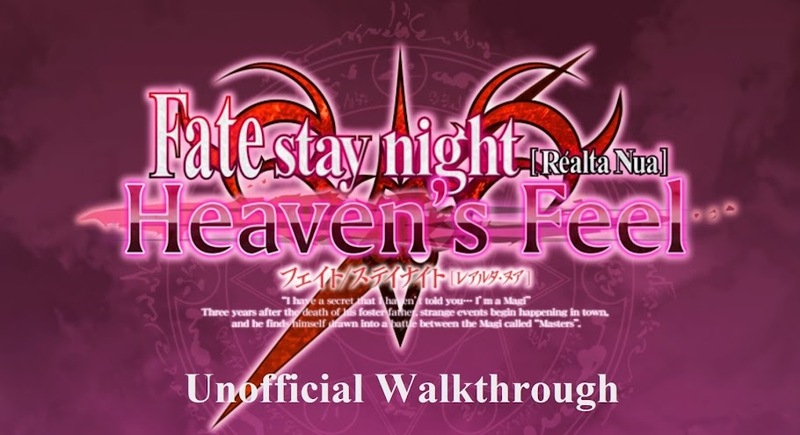 A 100% walkthrough of the Heaven’s Feel route of the Fate/stay night visual novel including all CGs, Tiger Dojos, and significant variations. These are not the only ways to get through, of course, but I picked the paths that give pretty much the most exciting and useful scenes. I will not be listing what all choices “don’t matter,” because if you were going to pick every option possible, why are you reading this anyway? If there is a choice that basically equates to do nothing and watch TV, I’m not going to have anyone make it who are just trying to get through. On that note, there is more than one, and sometimes several, way to reach certain Tiger Dojos, but I listed the simplest ways to reach them, or, in a case of equal simplicity, the most interesting. I do not entirely recommend using a walkthrough for this visual novel since it’s pretty easy to get through anyway. I compiled this originally from my notes I made for myself years ago on all the different ways to cause specific things to happen. So only use this if you’re still having trouble, you’re trying to get the Good End to Unlimited Blade Works (yeah, I’ll admit, that one is pretty complicated), or you’re trying to get all the Tiger Dojos. Which you should do that last one because it unlocks a unique scene if you do. If you are going for 100% completion, I would recommend saving at each choice that I have a “Note” under that indicates a different option, following that advice, then continuing from the “correct” option for your main save. Note you must finish Fate before you can unlock Unlimited Blade Works, and you must complete Unlimited Blade Works before you can unlock Heaven’s Feel. You do not technically need to in [Realta Nua] for Windows, but it’s still recommended. 1. I’ll go and help Sakura. 2. I’ll go to work. 1. I’ll take Sakura home. 2. I’ll make one more side dish since Sakura’s coming. 2. I’m worried about Sakura. 1. Consult her about Sakura. 1. I don’t hate you. 2. I’ll tell Sakura myself. 1. Should I go check on her...? 3. ...No, I’m worried about Sakura. 2. To show my apology, I’ll do anything she says. 1. Investigate the Ryuudou Temple. 3. Use my Command Spell...! 2. He didn’t want to kill me? 2. I can’t do this myself. I need Tohsaka’s help. 1. No, I can’t leave Sakura by herself. 2. I want to protect Sakura. 1. I really like her. 2. I should go see what’s going on. 2. I haven’t seen Rider. 2. ...I can’t do that. 1. Quickly go back home. 1. Save Sakura. Bring back Illya. 3. ...Give her the answer to the previous question. 2. ...Bring my arm down. 2. ...Is that the way?